Clifton Fadiman was an American essayist, literary critic, and noted intellectual who, among many other works, edited Fantasia Mathematica1 and The Mathematical Magpie2. 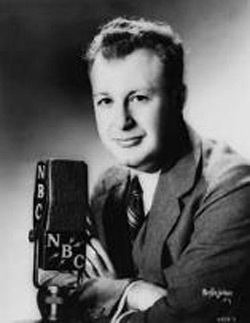 He became well known for the encyclopedic knowledge he displayed on the Information Please radio programs in the 1930s and '40s. 1. Fadiman, Clifton. Fantasia Mathematica: Being a set of stories, together with a group of oddments and diversions, all drawn from the universe of mathematics. New York: Simon and Schuster, 1958. 2. Fadiman, Clifton. The Mathematical Magpie: Being more stories, mainly transcendental, plus subsets of essays, rhymes, music, anecdotes, epigrams and other prime oddments and diversions, rational or irrational, all derived from the infinite domain of mathematics. New York: Simon and Schuster, 1962. Federico, P. J. "The Melancholy Octahedron." Mathematics Magazine, 45: 30-36, 1972.